When we reached an altitude of 10,000 feet, lap tops, Ipads, phones and miniature DVD players jumped into life all around me, as people prepared to entertain themselves during the two hour flight which lay ahead. My entertainment choice to some old fashioned, a paperback novel and conversing with Tom, the elderly gentleman sitting next to me. Tom had a lot to say, and was indifferent about my caring to hear it or not. Trying to be polite, I listen and nodded or smiled at the appropriate time. It took an explosion to quiet Tom. Actually, the explosion quieted everyone, momentarily at least. When a plane hits turbulence it shakes, sometimes violently, but the event is usually brief and not accompanied by loud noises. Seventeen minutes into flight 765 there was a violent explosion that came from the port side engine rocking our plane from side to side in a sharp rolling fashion; like someone was holding the 737 from its tail section, twisting it with their fingers. From my vantage point just forward of the engine I could see far too well what was happening. The engine was on fire; hard for me to believe given the speed we were travelling, but I could see flames and black smoke billowing from the engines. Those same laptops that jumped into life at 10,000 feet now flew dangerously through the cabin, crisscrossing through the air joined by drinks, phones, and an occasional shoe. Havoc reigned; people were screaming or crying, some had bounced from their seat and being unable to stand, they rolled in the center aisle. The captain regained control in fifteen seconds, but to us passengers it felt like hours. The injuries were minor, but many; however the flames were now gone and only dark smoke remained. I asked Tom if he were OK, and he said he was. The lady next to Tom in the aisle seat had spilt coffee over her white blouse, and in the confusion lost her purse. She was asking for help from the flight attendant, who was desperately trying to calm a very nervous cabin of frightened people. Smells of coffee, soda, beer and urine drifted through the plane. The captain told us over the intercom that we would be making an emergency landing in Los Angeles, where we had just left, and asked us to follow the instructions of the flight attendants. He also told us not to worry because this plane was designed to fly on only one engine. I thought to myself that was good since we only had one left. People were bleeding and crying, some were praying; many just sat with blank faces as we banked sharply, turning back to LAX. That is when the second engine just quit. We all knew what had happened. The engine sounds from the right side of the plane stopped; it was spooky quiet for a moment or two. Then we all screamed. Commercial aircraft glide very similar to a rock; they just tend to fall from the sky when no engines are working. The oxygen masks fell from their appointed places, and even though the flight attended had told all of us what to do, and even though most of the passengers had heard the safety speech dozens of times – most people did not know what to do. We were an aluminum tube filled with 127 panicky people falling quickly from the sky. Tom pulled so hard on his oxygen tube that he yanked it free from whatever it was attached to, rendering it useless. Fortunately, each row had four masks and three seats so I helped Tom get the extra one working properly. If panic described the passengers when the first engine blew, only mayhem could describe the conditions inside the cabin when the second engine quit. Screams of help, and fear erupted everywhere. Oh my God was the mantra of most. An elderly couple in row three just held each other, preparing peacefully and gracefully for what they knew was a certain death. The plane was in a steep descent; from my window seat I could see the earth quickly approaching. The scene in my small square window showed houses, with swimming pools in the backyards, and cars parked on the street. There were tightly built communities, strip malls, some rocky hillsides, and a crowded freeway. Nowhere did I see anything that might be used as a landing strip. As the certainty of our fate spread though the plane like a rolling fog, people settled into one of two extremes: terror or quiet prayer. A middle aged man in a blue suit screamed that he was going to sue the airline, in between cursing that there was blood on his new suit. I think the blood came from the bleeding forehead of the lady to his right – she has probably been hit by a flying laptop. Her hands were together, her head bent to her knees, and she was quiet amongst the turmoil. She was my inspiration. I did not want to die either, but I did not want to be crying in fear when I did. My style is to do the best that I can in everything, and then just let nature take its course. Looking out the window, it appearing nature would have its way in less than a minute. The plane had begun to spin like a lopsided top; out of control with nowhere to go but down. With the exception of sound of rushing air across the plane, and the squeaking of flexing metal, flight 765 became remarkably quiet. I was holding on with both hands and firmly setting my feet to the floor just to stay in my seat. A grassy field briefly appeared through my window. Good job Mr. Pilot, no one else need be hurt by our ill-fated accident. The earth was rushing at us remarkably fast; a blur of greens and brown filled the window. I do not know why, but I held my breath as the final moment ticked away. I envisioned a loud bang, a ball of fire, and then nothing. Instead, I felt nothing. One second we were travelling over 150 miles per hour towards the ground and death, and then we were still, drifting in midair about 20 feet from the small field in between housing developments. We had stopped in midflight, and then like a landing helicopter, we were gently placed on the soft earth. No fireball, no death. It was as if God had reached out and saved us, grabbing the jet in His mighty hand. It was a guaranteed miracle, witnessed by thousands. 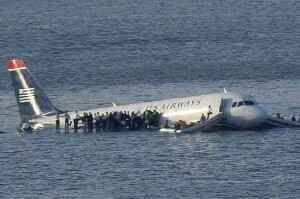 Cheering erupted everywhere on flight 765 – I hugged Tom, as he wept on my shoulder. If you want a miracle to occur in your life, you have to believe that miracles happen – truly believe. If you need a big miracle, you have to believe that God still performs big miracles every day, just like He did when Jesus walked the earth. There can be no doubt in what God can, and will do. Do you believe that today, God could stop a floundering jet from crashing by holding it in his loving hands? Remember the “Miracle on the Hudson River”, where 155 lives were saved by the heroic efforts of a pilot and crew by landing a commercial aircraft on the Hudson River? God can either work directly or through people to perform His miracles, that time He chose a brave pilot and crew. The size of your believe can shape the size of your miracle. Our God is the God of daily miracles, large and small, for those who believe and have faith. This entry was posted in Living a Christian Life, Talking to God, Where Are You Going Today and tagged believe, compassion, friend, God, good, hope, Jesus, love, Prayer, Thanks, trust, Wisdom by Michael Obermire. Bookmark the permalink. Mike, this was great, you had me scared for a moment that this was really happening to you (I knew you were alive because Lea would have mentioned it last night) but I thought maybe one of your flights had a problem. Wow! I was on the edge of MY seat reading this! Wonderful message and definite food for thought.